Blizzard has revealed some of the new cards that will be added into Hearthstone with the Blackrock Mountain adventure set to release next month. Some of them look like massive game-changers while others fail to impress. If you haven’t already read my first impressions of the cards that were shown off at the reveal event, I recommend getting caught up with that first. Here, I’ll be going over four new cards that Blizzard has announced since then and going over the potential strategies that they can offer. First up is the Warrior-exclusive Axe Flinger (pictured above). As it turns out, each class will receive two new exclusive cards with Blackrock, one common and one rare. For the record, the Rouge exclusive Dark Iron Skulker discussed last time is a rare. This is certainly good news to accompany the Axe Flinger reveal because he doesn’t have much to offer the Warrior class on his own. Dealing damage to the enemy hero is really only relevant in highly aggressive decks and Warrior tends to find its strengths in slow-paced board control. Yes, he can potentially deal 10 damage on his own, but that’s pretty wishful thinking. Aggro Warrior is certainly possible in constructed play, but the biggest problem with the Flinger is that he’s 4 mana for a 2/5. As I’ve said before, turn 4 is one of the most crucial in Hearthstone and you need minions that can deal with the fearsome stat lines that tend to come out at the time and Flinger certainly doesn’t do the job. 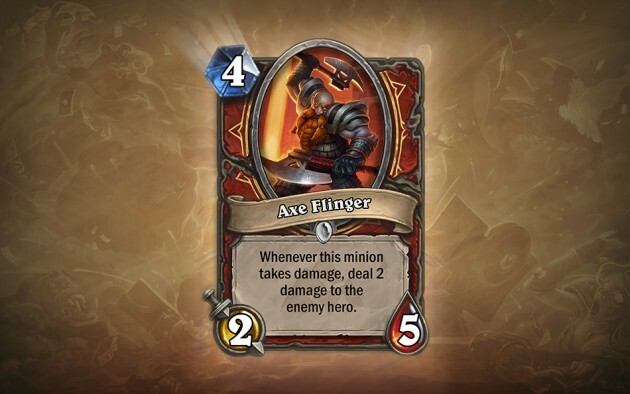 The worst place for Axe Flinger would definitely be Arena mode and the last thing Warrior needed after Goblins versus Gnomes was more bad Arena cards. Here’s hoping that the new rare turns out better than this guy. Next is the Shaman’s new rare, Lava Shock. As spell damage goes, 2 damage for 2 mana is pretty bad. However, this card’s ability to unlock your overloaded mana crystals is incredibly promising. The Shaman has a number of cards that have their mana costs divided over two turn with the overload effect, locking up mana crystals that you could otherwise use on your next turn in exchange for playing something cheaply now. The problem with overload is that, if your opponent is able to respond to your previous play, you’re left with less options for your follow-up and could quickly fall behind. 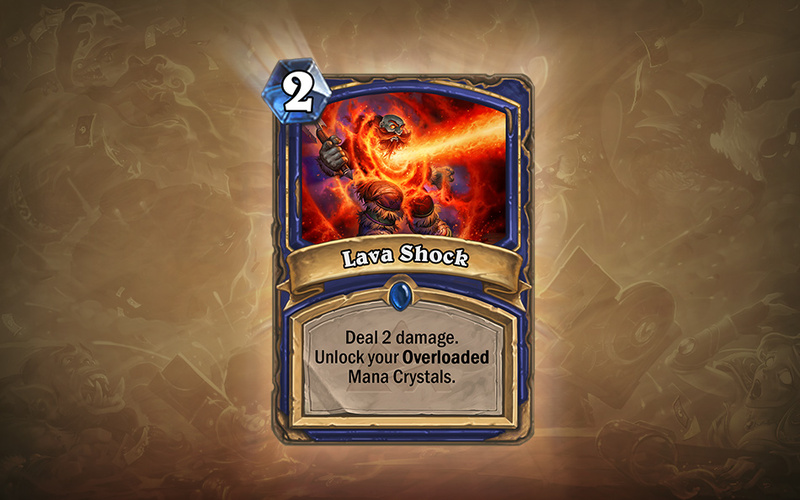 Lava Shock, if played at the right time, could actually generate more mana than you spend on it and allow you to burst ahead of your opponent with incredible results. Not only does it free up crystals that were locked for this turn, but also ones that were currently set to be locked on your next turn. It’s an incredible new twist on the Shaman class that is sure to lead into some fascinating new decks. For a new neutral card, we have Dragon Egg. 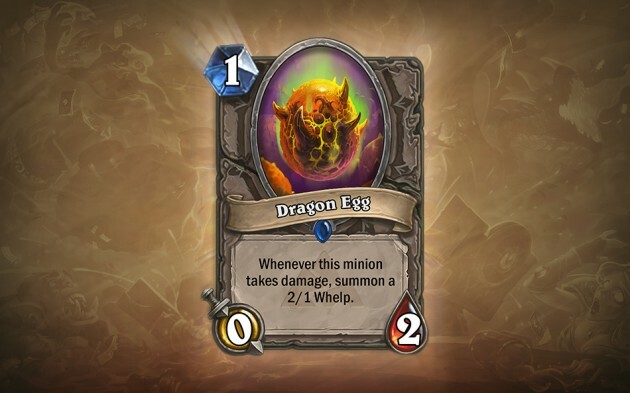 The obvious comparison for it is the Nerubian Egg that was introduced in Curse of Naxxramas and, between the two of them, this is definitely the weaker option. Nerubian Egg is useful not only for its ability to generate a 4/4 fairly easily, but it also acts as a counter to area-of-effect spells. Your opponent doesn’t want the egg to hatch and will be forced to avoid damaging it. In Zoolock, where AOE is one of your biggest threats, Nerubian Egg has remained a staple. Dragon Egg simple doesn’t have that same intimidation factor as a 2/1 is easy to deal with. It does have the ability to spawn multiple Whelps to swarm the board, but it demands a good buff for that to even be possible. I should also mention that, while the Whelps count as dragons, the card itself doesn’t and lacks any kind of dragon synergy based on the cards we’ve seen so far. Cards like Velen’s Chosen and Cruel Taskmaster can get good value out of it, but a Nerubian Egg or even a Worgen Infiltrator will give you more consistent effects. What makes this card especially disappointing is that it makes Hungry Dragon that much more of a threat. If your deck isn’t already designed to support a card like this, your opponent can safely ignore it as a wasted spot on the board. I’ve been hoping to see more good one-drops appear to help offset the Hungry Dragon’s incredible stat line, but this is pretty much the exact opposite. 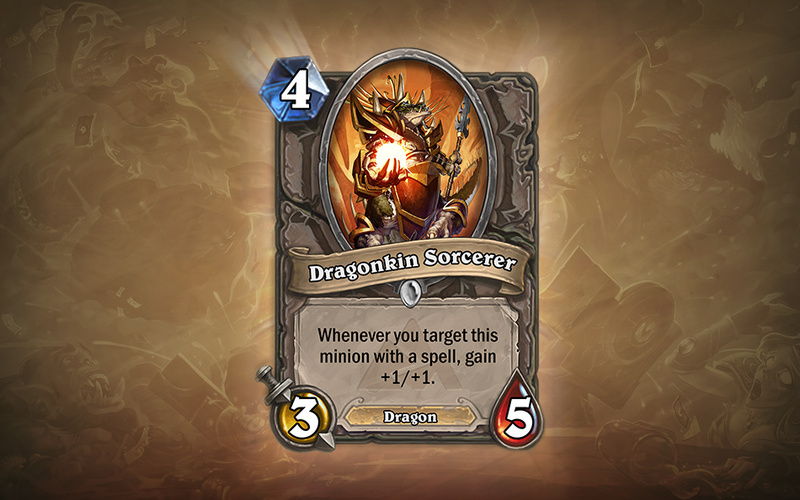 Finally, we have the Dragonkin Sorcerer. It’s effect is a bit odd, but I think the best way to describe it is like the added spell damage effect applied to buffs. He grows stronger whenever you target him with a spell and buffing spells would naturally become much more potent when used on him. You could trigger his effect with any targeting spell, but a +1/+1 buff generally isn’t going to useful if your just dealing damage to him. Also note that he doesn’t grow stronger when your opponent targets him. Being a dragon type with a decent 3/5 for 4 stat line, this will certainly be a strong card for Paladin, Priest, and Druid decks. A deck with access to a lot of spare parts cards would also make this minion devastating. That’s all of the cards we know of right now, but we’ll be sure to keep you caught up with any new cards that are revealed. Until then, be sure to let us know what you think of the new cards and what strategies you already have planned for these new cards.